The magic continues - after we left the pretty village of Tharwa we travelled via a roundabout route to Cooma - our overnight destination. Little did my travelling companions suspect that I had a slight detour planned. 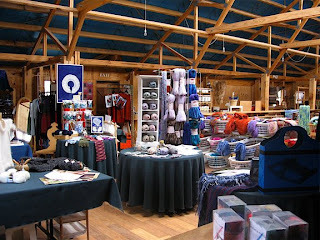 The Past Times Craft Centre had been highly reccomended to me by Sandra at SSK. 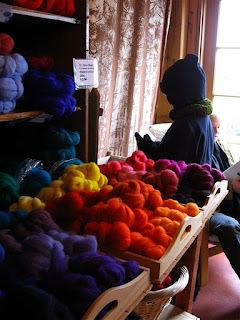 I knew there was a craft shop in the vicinity but what a shop, what a wealth of fibre goodness. I wasn't the only one to be captivated by all this and when we finally left I was amazed that my shopping bag only contained 2 balls of Tekapo yarn, 3 Ashford patterns and 1 Buzzy Bee key ring. It was a lovely shop and the sales person was extremeley helpful. Her patience in explaining the Knitter's Loom to the young lad was commendable - I'm not sure if he is into the whole weaving thing but it kept him distracted long enough for me to scout around both floors of this lovely shop. Glad you found the shop and enjoyed it as much we did. The photos make the shop look fabulous. Looks like a long weekend to Cooma coming up sooner rather than later.